Bakerzin held a special place in my heart. I proposed to my wife there during Valentine’s Day. Their Valentine’s Special was lovely and their desserts are to die for. I remember my first latte there was very nice. That was their Bangsar’s outlet. 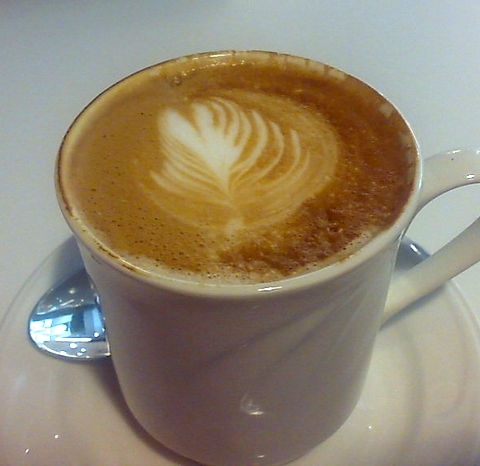 I went to the One Utama’s outlet recently for a latte. Note the attempt for a latteart. The one I had in Bangsar was better. But this time, I was a bit disappointed…. the milk was a little over-heated. If the temperature was kept between 65 to 70 degree celcius, it would have been great. Maybe the barista was having an off-day. Still, I give them credit for the attempted latteart. At least it showed that they are conscious about the importance of milk frothing. I ‘m sure I’ll go back there for their great dessert. And I’m sure I’ll give their coffee another try. This entry was posted in Bakerzin, Coffee, latte, Malaysia on January 26, 2008 by KF Chan.